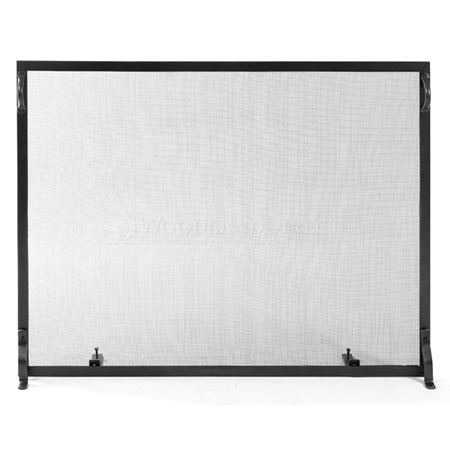 For Colonial or country contemporary homes that need accessories with clean lines, this plain and simple fireplace screen with no adornment will do the job. Adapted from designs of our American Colonial heritage, it is finished in a Graphite finish and available in three sizes. And because they're manufactured in high quality wrought iron, they can be used outside as well. Flat screens are a good choice, as they hug the fireplace surround which keep sparks from escaping. Some of our screens come with doors, so removing the whole screen for stoking the fire is not needed. Handles and feet are easily attached and are separately packed when shipped. compared to the custom screen of the same size that I priced this one is almost as good quality. Heavy gauge and solid. The Only complaint I have is that the included legs are a bit flimsy, small, and unattached for shipping. They require some adjustment to get the screen to stand upright and straight. I wish they were welded or maybe bigger but that would force the shipping box to be a bit bigger I guess. I may have them spot welded in place. Definitely worth the money and I plan to buy another for my second fireplace.